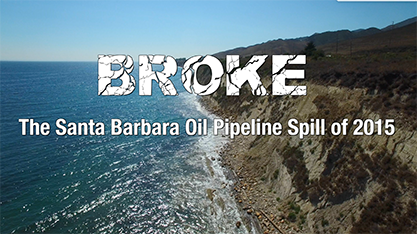 Santa Barbara – On Tuesday, March 20th at 6:30 PM, the Environmental Defense Center (EDC) will host a screening of BROKE: The Santa Barbara Oil Pipeline Spill of 2015 at the New Vic Theatre (33 W Victoria, Santa Barbara). Tickets are free, but RSVPs are required. Immediately following the film, guests will be invited to participate in a conversation between filmmaker and EDC Board Member, Gail Osherenko, and EDC Chief Counsel, Linda Krop. The evening will conclude with a reception. The evening has been arranged to raise awareness of, and support for, EDC’s work protecting the Santa Barbara Channel from the threatening offshore oil drilling expansion. BROKE tells the story of the May 19th, 2015, rupture in the Plains All American Pipeline which poured at least 140,000 gallons of crude oil onto the Gaviota Coast and into the Santa Barbara Channel. The spill killed at least 300 marine mammals and seabirds, closed 138 square miles of fisheries, and polluted beaches up to 150 miles away. While focusing on the disaster and the challenging efforts to attempt to restore the damaged coastline, BROKE also dispels the notion that there is any safe or risk-free way to drill for, or transport, oil. The film, which premiered in February at the Santa Barbara International Film Festival (SBIFF) has also been an official selection at the San Luis Obispo International Film Festival and won an IndieFEST Film Award. The criminal trial against Plains, delayed by the Montecito mudslide, is expected to begin this spring in Santa Barbara Superior Court. The state and county charges against the pipeline company are only the beginning of the end of the story. Plains still faces multiple class action suits for damages; the County of Santa Barbara is seeking monetary damages, and the Natural Resources Damage Assessment Process is ongoing. The 2015 spill will continue to be in the news for many months to come. BROKE will screen at the New Vic on March 20th at 6:30PM. To RSVP, call 805-963-1622, email EDC@EnvironmentalDefenseCenter.org, or visit www.EnvironmentalDefenseCenter.org.